From the David Gahr Archives and DavidGahr.com, a gallery of the mavericks of the American Folk Music Revival and images of Greenwich Village circa1961 that served as the inspiration for the Coen Brothers new folk noir film and soundtrack, Inside Llewyn Davis. Included here are such seminal figures on the folk music scene as Dave Van Ronk, Len Chandler, composer of Green, Green Rocky Road, Hedy West, composer of 500 Miles, Tom Paxton, composer of The Last Thing on My Mind, Mike Seeger and John Cohen’s old-timey music group, The New Lost City Ramblers, and the traditional Irish singing group, The Clancy Brothers. Also. here are the figures behind the music, such as music impresario Albert Grossman (Bob Dylan, Peter, Paul, and Mary, Odetta, Janis Joplin), rhythm and blues composer Doc Pomus, and Folkways Records founder Moe Asch. David Gahr’s lens on the folk music scene of the 1950s and ’60s in Greenwich Village and the historic Newport Folk Festivals provided the music and the period with indelible, iconic images remembered by an older generation of folk music fans who were there, and serve as historic record for new generations discovering folk music and the roots of the singer songwriter in the legacy of the folk music revival. With over 500 essential images of the American Folk Music Revival of the 1950s and 1960s, David Gahr’s The Face of Folk Music (1968) established the photographer as a visual virtuoso and a recognizable influence in any consideration of popular music photography. The Face of Folk Music is the image bible of the rise of the American musical counterculture in the late 20th century and, though out of print, coveted by collectors. 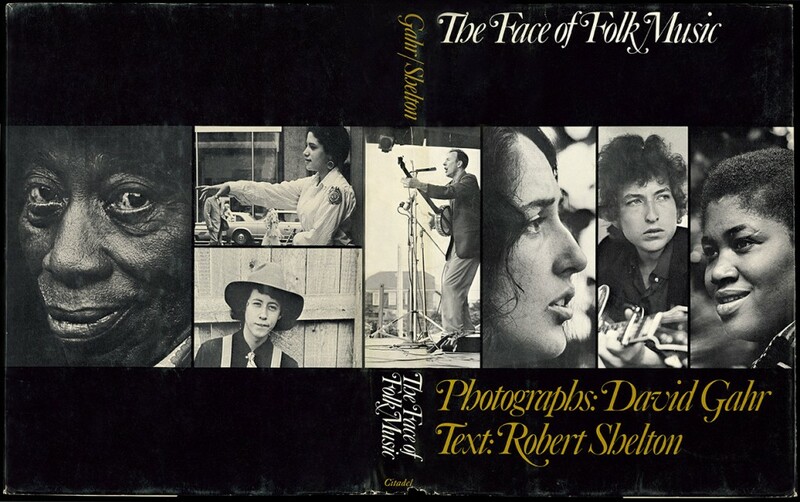 Gahr’s defining portraits of the folk revival mavericks Pete Seeger, The Weavers, Bob Dylan, Joan Baez, Odetta, Dave Van Ronk, Ramblin’ Jack Elliott, both Woody Guthrie and Arlo Guthrie, Joni Mitchell, Leonard Cohen, and so many more, some sadly forgotten, the scholars, song collectors, and record producers like Charles Seeger, Alan Lomax, Moe Asch, Irwin Silber, and Harry Smith, and vital visual documentation from the epicenters of the folk movement in New York’s Greenwich Village and the historic Newport Folk Festivals from 1959 and throughout the 1960s are historic record through a master’s lens. The folk and blues images contained in The Face of Folk Music and Gahr’s photographic legacy resonate deeply in the culture in 2013 for a whole new generation of folk music fans with the chart success of the contemporary folk music of Mumford & Sons and The Avett Brothers, in the cinema directors the Coen Brothers’ latest, the ’60s-era Greenwich Village folk noir film, Inside Llewyn Davis (December 2013), on the page, Jonathan Lethem’s critically praised Greenwich Village novel, Dissident Gardens (2013), as well as the enduring folk icon Bob Dylan’s Never Ending Tour into the first half of the new century with as much cultural impact as the musical poet created in the 1960s.